This is an unbelievable value!!! They just don't come any cleaner and ready to go! 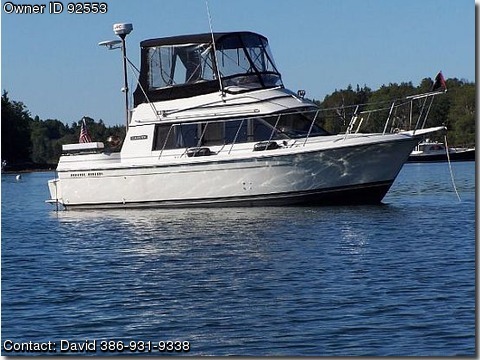 This lucky vessel has had the same meticulous owner for the past 14 years.He is now moving up to a bigger boat and this one is avalable right now. She was re-powered in 2002 with a pair of Ford 351s ,260 HP each.The exhaust manifolds and risers were replaced in 2010. The roomy interior feels like that of a much larger vessel and was completely upgraded with new cushions and curtains.A stand up shower and head also add to your cruising comforts. While you're sitting on your new Flybridge cushions you can also be enjoying the use of the Garmin GPS,JRC 16 Mile Radar,and Icom VHF Radio. An AM/FM/CD Player, Both a Fresh and Salt water wash down in the cockpit, Battery charger,Remote Spot Light,and Much,Much More. The bottom has just been painted and this one is truly ready to launch for the next captain and crew. Call today to arrange a showing.